The execution of Steven Staley: Forcible medication on death row in Texas. It’s a macabre spectacle, and it should be stopped. Can the state force a person to take drugs in order to execute him? That is the grisly question raised by the case of Steven Staley, a convicted murderer who believes polygraph machines are controlling and torturing him. 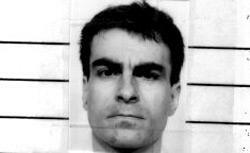 Even though he’s psychotic, Staley is scheduled to be executed next week, based on a judge’s order requiring him to take medication he has refused. If Texas actually goes ahead with this deeply disturbing plan, it will be the first state, as far as I can tell, to drug someone in order to carry out a death sentence. That is a distinction that no one on the planet should want to have. Update, May 14, 2012: On Monday, the state appeals court stayed Staley’s execution for procedural reasons without ruling one way or the other, on forcible medication. Here are the facts of Staley’s crime: In September 1989, he escaped from a Denver jail and went on an armed robbery spree, hitting up nine businesses in four states. The last one was the Steak and Ale Restaurant in Tarrant County, Texas. Just before closing, Staley and two friends came in, and Staley herded the employees into a kitchen storeroom and made manager Robert Read open the cash registers and the safe. He then took Read as a hostage, forced him into the back of a car, and shot him dead during a high-speed chase by the police. And here are the facts of Staley’s mental illness: He has a long history of paranoid schizophrenia and depression. Staley was abused as a child by his mother, who was also mentally ill; when he was 6 or 7 she tried to pound a wooden stake through his chest. His father was an alcoholic. Staley tried to kill himself as a teenager. Doctors who have examined Staley on death row have said that he talks in a robot-like monotone yet has “grandiose and paranoid” delusions, including the beliefs that he invented the first car and marketed a character from Star Trek. He has given himself black eyes and self-inflicted lacerations and has been found spreading feces and covered with urine. Medicated with the anti-psychotic drug Haldol, Staley complained of paralysis and sometimes appeared to be in a catatonic state. He has worn a bald spot on the back of his head from lying on the floor of his cell. What is behind Judge Salvant’s chilling decision? In two cases in the 1990s, the Supreme Court said that the government can forcibly medicate a mentally ill inmate if he is dangerous to himself or others, the treatment is in his medical interest, and there is no less intrusive alternative. In 2003, the court acknowledged concerns about side effects of the drugs, and emphasized that the treatment had to be medically appropriate. None of these cases involved pending executions, however. When death is the state’s end goal, how can anyone argue that forcible medication is in a prisoner’s medical interest? The Louisiana and South Carolina supreme courts have both rejected that macabre contention in ruling that to drug someone in order to execute him would violate their state constitutions. The U.S. Court of Appeals for the Eighth Circuit cracked open the door to forcible medication in 2003, in ruling that the state could execute a man who’d regained competency by taking medication on death row. The constitution doesn’t preclude executing someone who is “artificially competent,” the court said. In that case, the prisoner wasn’t refusing to take his meds, so the scenario is different than Staley’s. But this is the legal precedent that Judge Salvant cited when he ruled that forcing Staley to take Haldol would be “medically appropriate”—even though the purpose of drugging him is to make him rational enough to kill him. I will pause in this grim tale to note, with relief, that the American Medical Association and the American Psychiatric Association hold that it is ethically unacceptable for doctors to prescribe drugs to restore competency for the purpose of execution. This should be an easy call for the Texas courts as well. If it’s awful to imagine psychotic prisoners going without their meds, it’s more awful to force shots on them so the state can kill them. If Texas fails to grasp this, other inmates will follow Steven Staley. Mental illness is common on death row. The only reason that the issues raised in Staley’s case haven’t been decided before, defense lawyers tell me, is that humane prosecutors and judges don’t insist on executing people whose sanity is so uncertain. There’s a larger question here, beyond the one about forcible medication. It’s about halting the execution of the seriously mentally ill in the same way, and because of similar concerns about a defendant’s impairment, that the states have stopped executing the mentally disabled. Kentucky recently considered such a law and Connecticut has one. If Texas and other states followed suit, we would be spared the miserable spectacle of executing people who commit terrible crimes, but also have terrible deficits. People like Steven Staley and Scott Panetti and Andre Thomas.